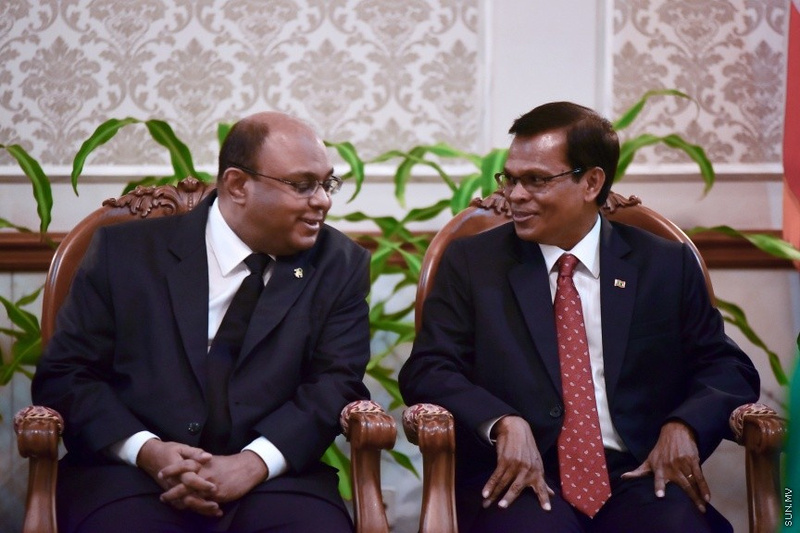 Chief Justice Abdulla Saeed (L) with Speaker of People's Majlis, Abdulla Maseeh Mohamed. Ruling, Progressive Party of Maldives (PPM) has submitted an amendment to the Judges Act, which will disqualify judges who are convicted of a criminal offense by a court of law. The amendment was submitted to the People’s Majlis on behalf of PPM by Fonadhoo MP Abdul Raheem Abdulla (Adhurey). The proposed amendments include an additional point to the criteria for judges. The addition, Article 15 (b) (v) of Judges Act states a judge cannot be someone serving a sentence for a criminal offense. Adhurey has also proposed adding Article 24, which states judges arrested for a criminal investigation must be suspended with pay, and that judges charged with a crime must be put on suspension without pay. In addition, Adhurey has proposed amending the law so that rulings issued by lower courts regarding judges must be submitted for appeal to the High Court within 10 days, rulings made by High Court regarding judges must be submitted to Supreme Court for appeal within 10 days, and the Supreme Court must issue rulings in such issues within 30 days. The judges will also be disqualified the moment they are found guilty of a criminal offense. Article 154 (b) of the Constitution states judges can only be dismissed from their position when the Judicial Services Commission finds the judge incapable or guilty of an inappropriate act, requests an impeachment with the People’s Majlis, and two-thirds of the lawmakers present during voting approve the impeachment. An addition has been made to the Judges Act, stating the Article 154 (b) of the Constitution is not applicable to judges convicted of a criminal offense, as the dismissal is not a penalty over a procedural issue from that point. The amendments, if passed by the People’s Majlis, will become effective the moment it is ratified by the President and published on the Government Gazette.